Every time we head towards a new phase of life, it is considered auspicious to take the blessings of the Almighty. And that’s the reason why the majority of rituals of the Indian weddings include a lot of pujas and similar activities. After all, it is an important event in a person’s life. 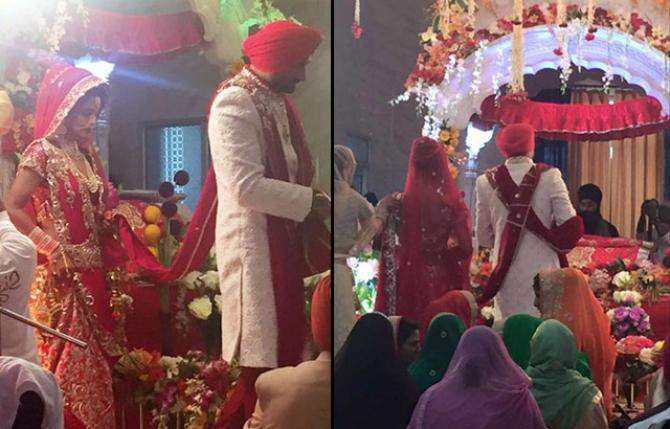 After seeing each other for 8 long years, the ace cricketer Harbhajan Singh and his longtime beau Geeta Basra finally took the plunge and got married on October 29, 2015, in Jalandhar. The couple married as per Sikh rituals in a gurudwara. The wedding was only attended by close family members and friends. The renowned cricketer Sachin Tendulkar and his wife Anjali were also among the celebrity guests who had attended the wedding. Later the couple had a wedding reception. 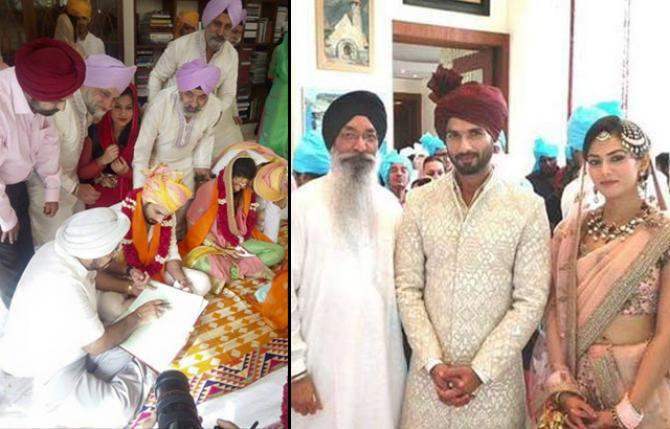 Popular Actor Shahid Kapoor tied the knot with her ladylove Mira Rajput on July 7, 2015, in a Sikh wedding. The wedding took place in Delhi and was attended by the close family members and friends of the couple. For the wedding, Shahid donned a white kurta-pyjama and paired it with a pink and yellow safa. While Mira wore a simple pink and green suit. 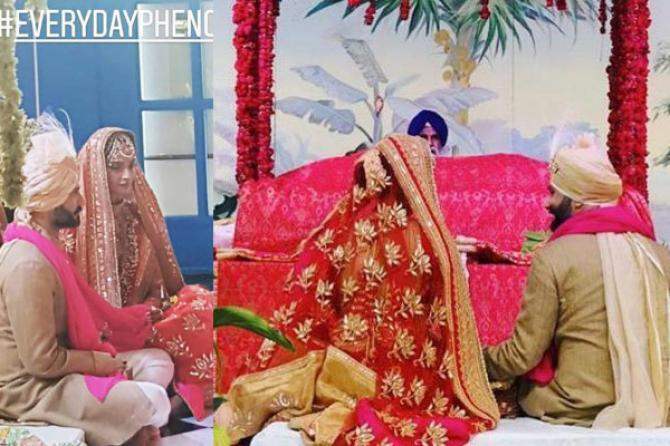 There were only a few pictures of their gurudwara wedding that ever got viral on the internet. But looking at them one can admit that Shahid and Mira’s wedding was no less than a grand affair. After the wedding, the couple hosted grand reception parties in Delhi and Mumbai. 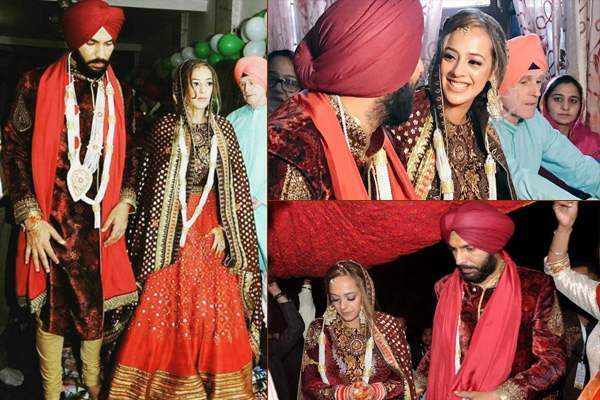 Another ace cricketer, Yuvraj Singh tied the knot with the love of his life, Hazel Keech on November 30, 2016. The two got married in a Sikh wedding at the Fatehgarh Sahib Gurudwara, near Chandigarh. The venue of the wedding was decided by Yuvraj and his mother Shabnam Singh’s guru, Baba Ram Singh Ganduan Wale. After their Anand Karaj ceremony, the couple took blessings from him. As per reports, it has been told that Hazel even had to change her name to Gurbasant Kaur to marry Yuvraj according to Sikh rituals. The Popular face of the reality show, Roadies, Rannvijay Singh left everyone stunned after he announced about his wedding with his longtime girlfriend, Priyanka Vohra. The couple tied the knot on April 14, 2014, in a Gurudwara in Mombasa, Kenya. The wedding was attended by close family members and friends of the family. Popular actress Sonam Kapoor Ahuja tied the knot with her longtime beau Anand Ahuja on May 8, 2018, in an Anand Karaj wedding. Their wedding was a starry affair with the entire Bollywood family present during the celebrations. The Anand Karaj took at Sonam’s aunt’s place. Sonam wore an Anuradha Vakil creation and the groom, Anand Ahuja wore a Raghuvendra Rathore outfit. They looked absolutely adorable together. Pictures of their wedding are going viral on the internet even today. 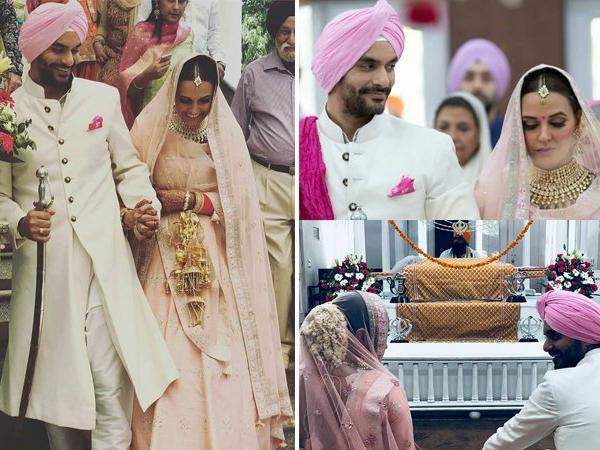 Neha Dhupia tied the knot with her alleged boyfriend Angad Bedi in a hush-hush ceremony in New Delhi at a gurudwara. 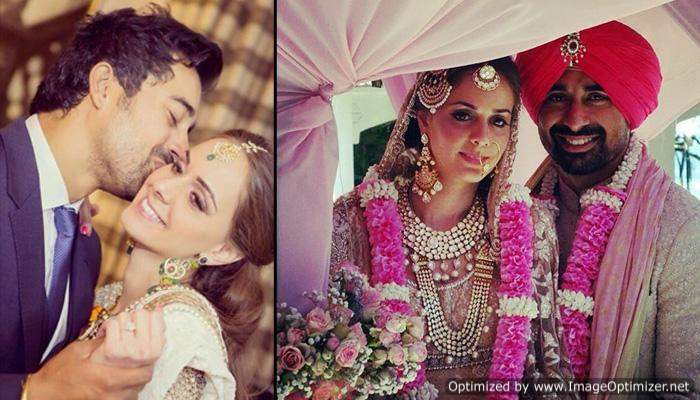 Just like Sonam and Anand, Neha and Angad too got married in a traditional Sikh ceremony. Since the wedding was a private one, it was only attended by close friends and family members of the couple. For the wedding, Neha looked breathtakingly beautiful as a bride, dressed in a soft pink lehenga, which she perfectly teamed with a golden choker, heavy jhumkas and a maangtika. Angad, on the other hand, looked classy as a groom in his white sherwani and a pink turban. Katrina Or Alia? Who Wore The Sharara Saree Better?